Music related blogs and social networks are not hard to find, but to locate tips on marketing for the independent artist, solo musician, or advice to create an unforgettable band profile takes more research. Musicians wanting to market themselves using the Internet with blogs and social networks only need to follow some timely suggestion accompanied by a routine. This advice will be for the “newer” artist or band, but if you need more exposure for your music group, then these steps are for you as well. First and foremost … this will take some dedication, patience, time, and consistent work … yes, I said the “W” word but, if the time you spend is spent wisely, you will see results much faster. To reach the “masses” and gain exposure you will need to first focus on getting your name ranked on the search engines. Sit and decide (if you aren’t 100% on what image and style you want to portray) what flare and style you want to relate to your band. Without a bit of your own color “popping out” you will possibly get “washed out” on the Internet. With the amount of competition you have on the net, you will need to become the image you present to your fans and set the image to encompass exactly what your band breathes out creatively. Choose first your color scheme and a logo. If someone you know or a member of the band is inventive, maybe they would design a basic logo for you that you could then build off of later or add to to evolve a signature for your sound. Take this logo and include it in banners, graphics, and buttons of several sizes to place on blog sites, social networks, and other web pages. Now that you have your image, color scheme, and logo, you will need to choose one major photo and up to two others to represent your group. Include the major photo into a few of your banners or graphics. Purchase the domain names (GoDaddy.com) to match the band name and look into securing the trademark (USPTO.Gov/main/trademarks.htm) for your band name. Purchase the dot com, dot info, and dot net domain names for certain and possibly some others. These will be forwarded to your blog site, a social network that houses you music clips, some personal band information, and your events. List All of your events, even if they seem small or insignificant to you like a friends birthday party. These can be called “private” events, “invitation only”, and meant to seem exclusive. You major blog site should also be podcasting enabled like Blog Talk Radio or Podbean or choose Vox, Blogspot, or a WordPress blog. All of these sites are able to house podcasting widgets from Utterli, Blog Talk Radio, or any HTML based blog widget to house your sound so visitors to your blog can listen in. Setting up an additional “all in one” blog style site at FreeWebs may become more time consuming than you had anticipated, but this is a wise choice if you have a few members of your band that pitch in and help. These sites will become your blogging base. Giving similar information on each site but adding a personal snippet of information new to each site will help keep them individual and fresh. Try including a different tune at each separate site with links back to each from all sites. Depending on your marketing resources and budget, you can do this totally free but with more time spent or fifty percent free with a little less time invested. Fast tracking a blog platform through a paid site like Host Gator using a WordPress blog will allow a bit more leverage with advertising. Using a free to create blog platform, you will need to temper your “personal advertising” greatly. Keeping the self serving links down to a minimum until you your blog site becomes established in the ratings. Choosing the social networks to promote your music is next on the list in your market me adventure. MySpace is the music social network that you should start with, being certain to set your MySpace URL and display name to your band name, the same as your domain names that you purchased. This will get that search term set in stone. Choosing four more search terms to add to this one will be your next step and use them all in your blog posts, social networks text, and other site information. Be sure to ask yourself what music lovers will ask when searching for your style of music, this will help you discover your major keywords. The key to massive exposure is not taking a handful of salt and flinging it over a great area, but to take that salt and spread it liberally over a few key areas with concentrated flavor, focus, and consistency. Working your sites with concentration like a pattern will attract excited passionate fans who then spread the word for you. Is eight to ten sites really concentrated? It may sound to you like the half the Internet and an extreme amount of time, but with your two to three blog style sites and your four to five social networks, all linked together, with similar but separate information on them, all using the same major keywords and added different minor ones, your exposure will grow exponentially. There are those who begin a social network of their own for the band at sites like Wetpaint or Ning. This is very time consuming and unless you have a specific band member to take this lone task on, wait on this idea and opt for starting a group at MySpace and one at Facebook for your band. No, Facebook does not allow for a “band” profile, but you can have a personal Facebook page and start a “My Band” group to promote your band at Facebook. With the excitement and growth over at this social network, you would be missing the boat without a group here. Even starting a group at one of the Ning social networks that is music oriented is a great idea. Connect your Twitter to Facebook and MyBlogLog to all of your blogs and social networks keeping your reach connected for a triple dose to Google and other search engines. Staying consistent with your time spent and your keyword usage is as easy as figuring out a budget. Decide how much time you have to work on the Internet, then divide your time equally between each of your sites. Choose your music social networks by doing a quick Google search or take a look at a few of these: IndabaMusic; Last FM; iLike; JamNow; FlowTones; MusoCity; PureVolume; HumbleVoice; imeem; and R4Media. Connect yourself with all of your sites by linking back on individual posts, bulletins, and link lists, stay consistent with your activity, make as many contacts and friends as you can, and enjoy your success. Looking into some of the coolest of music blogs and social networks sites we came across Last FM. With music, radio, events, and charts for top weekly artists, Last FM has a whole site feel for everything music 🙂 From one of the favorites at Last FM, Jason Mraz, to Marilyn Manson, Beethoven, The Beatles, Hoobastank, and No Doubt with everything in between. Feel free to add to and subtract from as you go along. 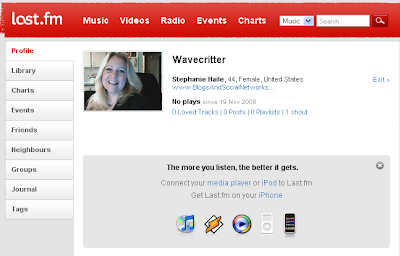 Click settings and a photo or other profile information, then add to your music and artist selections. Tag adding or keyword tagging is a big draw here at Last FM. Google and other search engines eat these keywords up so be sure to tag away. Last FM does a lot of the thinking for you really in addition to being a breeze to set up and navigate, a totally stress free way to enjoy your music. Connect your ipod or media player to Last FM or get Last FM on your iphone. For Windows, a quick download will get you connected no worries. Theres forums, friends, groups, contests and promotions, and (drum roll please :), wiki pages too! Free to register, add music, and usee all the main features at Last FM and they offer promotional features that are purely optional at a minimal cost. Widgets that you can customize with your recently listed tracks, overall top tracks, top artists, change colors, and automatically add this Last FM widget to your Live Journal or Netlog pages or embed the code is also available for other sites like Blogger. Theres a taste-o-meter widget to compare your tastes with your friends, a Bebo widget, Facebook, radio player, and quilt widget to show your top albums! Nice. Last FM has the widgets going on for sure with recommendations and much more.